I was in a restaurant quite recently, and the waitress – not a native speaker of English – was describing the desserts on offer. I was surprised when she told me that one of them was made of beer. That, at least, is what I heard. After a while it became clear that the dessert actually contained pear, the fruit. The English consonant p is one of three (p, t, k) which are aspirated at the beginning of a word. 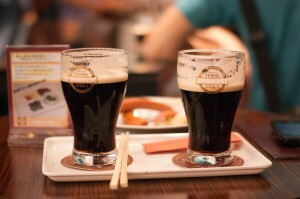 This is crucial to differentiate them from English b, d, g. Native speakers of English are very sensitive to this sound difference, and if we natives don’t hear aspiration, we are likely to think we’ve heard a word beginning b, d, g (like beer) rather than a word beginning p, t, k (like pear). Aspiration is a challenge for all English learners whose mother tongue has little or no aspiration; this includes Spanish, Portuguese, Italian, Japanese, Russian, Finnish, Estonian and many other languages. Even high-level English users from these backgrounds often don’t aspirate enough. I’ve made a video explaining aspiration which you can watch here. The vowel of pear is problematic partly because of the spelling and partly because of its actual sound. 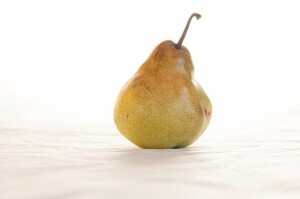 The fruit pear isn’t pronounced like the second syllable of appear. It’s pronounced exactly like pair and the second syllable of compare, so it rhymes with bear/bare, wear/where, swear and hair. The vowel of these words is a more open sound than the ‘e’ of most languages: in the International Phonetic Alphabet the English sound is ɛ. Americans will pronounce the r, so bear/bare, wear/where, hair are pronounced bɛr wɛr hɛr. In England a long vowel is used, giving bɛː wɛː hɛː. However, many dictionaries write this as AmE ‘/er/’ and BrE ‘/eə/’. Typically non-natives see ‘e’ and simply use the ‘e’ sound of their mother tongue, which is likely to sound too close, more like the English vowel ɪ. This occurs in words like beer, here, year and the second syllable of appear: bɪr hɪr jɪr əpɪr (AmE), bɪː hɪː jɪː əpɪː (BrE). As a result many non-natives pronounce words like bear/bare, wear/where and hair more like native pronunciations of beer, we’re and here.